Maybe it's time to put your love of terrariums to good use and grow some good eats? 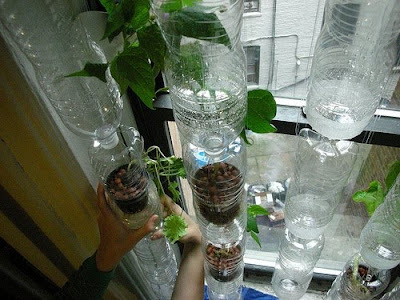 Check out this exciting trend of "Window Farming" at the Mother Nature Network. I know the apartment dwellers have been working on balcony and windowsill gardens but- I really think this is something new and different. Have you had any experience with window farming? The article explains but man-o-man: check out windowfarms.org and prepare to peruse for a while. NPR hit the airwaves last weekend with a story on a bourgeoning urban gardening movement that started out in Brooklyn (natch) and has caught the attention of greenthumbed apartment-dwellers in cities across the globe who, for one reason or another, would rather grow indoors instead of take to the roof. It’s called window farming and it’s a year-round, hydroponic (soil-less) vertical gardening technique that requires recycled 1.5 liter water/soda bottles, a fish tank air pump, plastic tubing, and clay pellets — all stuff that can be acquired on the cheap from a recycling bin, hardware store/gardening center, and pet store (windowfarming.org also offers a start-up kit). A window that gets plenty of sunlight would also be most helpful. Oh my! That is just about the coolest thing I have seen in a long time! In my old apartment, I had extremely bright sunlight flooding in all day long, with no balcony. This would have been so perfect! I am so glad you blogged about it. Thanks! Thanks for the enthusiasm Rachel! I was really excited to see these as well- it's a great idea and really beautiful.